A nice debate has started brewing about the records of Presidents Jimmy Carter versus Ronald Reagan on spending–thanks to US Sen. Rand Paul who again seems to be setting the terms of the debate. Mother Jones has published a video of Rand taking issue of spending rising faster under Reagan that it did under Carter. It’s worth emphasizing, in case details like these make a difference, that Paul’s criticism of Reagan’s fiscal record happened to be accurate. The budget deficits were smaller under Carter than Reagan. 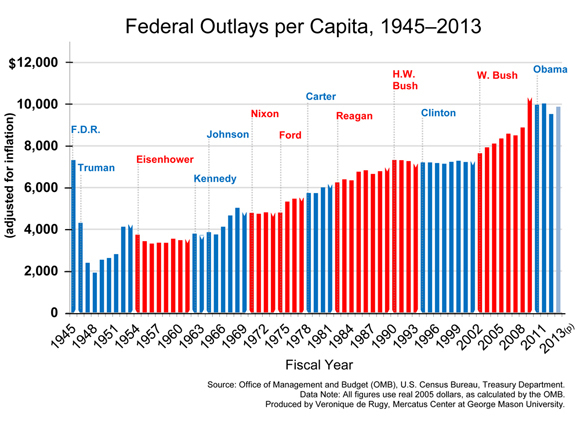 Federal spending grew slower under Carter than Reagan, too. But to put it mildly, Republicans don’t want to hear any of this, and they tend to be thoroughly unhappy when anyone compares Reagan unfavorably to Carter, even when the analysis is true. Reason has now got into the act with a story here. They basically confirm that Rand's facts are right before concluding, "The short version: Reagan spent like a drunken sailor and skipped out on the bill." As de Rugy does the math, Carter increased real spending 17 percent over the last budget of his predecessor, Gerald Ford. Over two terms, Reagan increased spending by 22 percent over Carter's final budget. On an annualized basis, then, Carter grew spending by 4.25 precent a year, while Reagan grew it by 2.75 percent. However, when expressed as a percentage of GDP, spending under Carter averaged 20.6 percent per year while Reagan averaged 21.6 percent. Spending typically really gears up in a second-term president's final years, so it's plausible to theorize that had Carter managed to stick around for eight years, he might have equaled or surpassed what the real-world Reagan managed. For those still reading along, thanks, and you might be asking, what if anything does this have to do with free banking? Well, I would like to posit that it is at least tangentially related in that from what I remember from the early days of the Reagan Administration, he cut a deal with Congress on spending that would have had nominal growth but real cuts based on then projected inflation. The blame then goes to Federal Reserve Chairman Volcker for slaying the inflation dragon much faster than anticipated so that the projected real spending cuts became real spending increases. The 1981 administration forecast for inflation for the 1980—86 period was a 7.1 per-cent annual rate; the actual inflation rate during this period was 5.1 percent. So, in conclusion, yes, Rand Paul is right to raise spending as an important economic issue and take sacred cows out for fair examination–but let's not forget that the Federal Reserve deserves its share of blame both for confusing economic planners as well as monetizing budget deficits. Why Bans Will Not Encourage "Responsible Innovation"